Why Are We Concerned About Drug Residues in Animal Mortality Compost? With disease issues, the decline of the rendering industry, a ban on use of downer cows for food, and rules to halt horse slaughter, environmentally safe and sound practices for disposal of horses and other livestock mortalities are limited. Improper disposal of carcasses containing veterinary drugs has resulted in the death of domestic animals and wildlife. Composting of carcasses has been performed successfully to reduce pathogens, nutrient release, and biosecurity risks. However, there is concern that drugs used in the livestock industry, as feed additives and veterinary therapies do not degrade readily and will persist in compost or leachate, threatening environmental exposure to wildlife, domestic animals and humans. Two classes of drugs commonly used in the livestock and horse industries include barbiturates for euthanasia and non-steroidal anti-inflammatory drugs (NSAID) for relief of pain and inflammation. Sodium pentobarbital (a barbiturate) and phenylbutazone (an NSAID) concentrations in liver, compost, effluent and leachate were analyzed in two separate horse carcass compost piles in two separate years. Horse liver samples were also buried in 3 feet of loose soil in the first year and drug concentrations were assessed over time. Year 1- On 9/22/09 a 6 x 6 m piece of 10 mil plastic sheeting was laid on bare soil with a 2% slope, at the edge of Cornell University’s compost site in Ithaca, NY. Water was poured on the plastic to check the direction of flow. A hole was dug at the low end of the pad, under the plastic, large enough to fit a 76 l galvanized garbage can. A stainless steel canner was placed in the garbage can to collect effluent. A hole was cut in the plastic over the canner for collection. A 0.6 m high base (3.7 x 3.7 m) of coarse carbon material (woodchips) was laid on the plastic. A 27 year old Appaloosa mare, weighing approximately 455 kg that had been dosed with 1 gram phenylbutazone at midnight on 9/22/09 and again at 8:00 am was led onto the base and euthanized for severe lameness by a qualified veterinarian with 120 ml Fatal Plus® solution (active ingredient 390 mg/ml Pentobarbital Sodium). After the horse had been euthanized and the veterinarian ensured there were no signs of life, the carcass was maneuvered onto the wood chips with the head on the upward slope of the pad. The liver was removed from the horse and cut into 48 pieces, each weighing approximately 100 grams, and nylon mesh bags were then placed in whiffle balls. A 2 m length of nylon twine was attached to each ball. Twenty-three balls were inserted in the horse’s gut cavity and 22 balls were placed in a 1 m hole in the ground (burial hole) which was dug approximately 1.5 m from the pad. Pieces of the intestine and some blood were also placed in the hole to help mimic the presence of a carcass. The remaining 3 nylon mesh bags with liver were packaged for delivery to Cornell University’s Animal Health Diagnostic Center (AHDC) to determine initial NSAID and barbiturates concentrations. Two Hobo U12 data loggers with 4 temperature probes each were set up to record hourly temperatures. Five of the probes were placed in the compost pile: under the horse’s chest, in the horse’s hind gut, in the horse’s chest cavity, under the horse’s spine and under the horse’s right hind quarter. Two of the probes were placed in the burial hole and one probe was left out to record ambient temperature. The hole was covered with loose soil. The horse was covered with woodchips so that the pile was approximately 1.8 m high. The plastic liner was tightened by rolling it over and under wooden fence posts. Year 2- In year 1, the collection of “leachate” included precipitation that diluted the leachate. In year 2, to target only the liquids that leached out of the horse and through the pile, two 3 m long troughs with a 1% slope were built out of 15 and 10 cm diameter PVC pipe attached to 5 x 15 cm untreated lumber. The troughs were placed on the pad from the centerline to the edge of the pile end-to-end with slopes going toward the outside of the pile. Leachate drained via gravity into 2-liter polyethylene bottles attached to the troughs. The exposed ends of the troughs were covered with 1 m length of aluminum flashing to keep rainwater out of the collection bottles. On 8/10/10 the leachate collection troughs were laid on bare soil with a 2% slope at the edge of Cornell University’s compost site in Ithaca, NY. A 0.6 m high base (3.7 x 3.7 m) of coarse carbon material (woodchips) was laid on top of the troughs. A 22 year old horse weighing approximately 590 kg, that had been dosed with 1 gram phenylbutazone at midnight on 08/10/10 and again at 7:30 am, was led onto the base and euthanized by a qualified veterinarian with 300 mg xylazine as a sedative, then with 120 ml Fatal Plus® solution (active ingredient 390 mg/ml Pentobarbital Sodium). After the horse had been euthanized and the veterinarian ensured there were no signs of life, the carcass was maneuvered on the wood chips with the head on the upward slope of the pad. The veterinarian took 4 tubes of blood from a vein in the nose and a vein in the front leg of the horse in heparinized Vacutainer® tubes for initial concentrations of pentobarbital and phenylbutazone. Twenty-six whiffle balls that had been pre-filled with wood chips (the base material of the compost pile) were placed such that they would be under the horse and liquids coming from the horse would be absorbed by the chips inside the balls, as well as in the surrounding base material, while the excess would drain down the leachate collection troughs and be captured in the 2 liter bottles at the end of the troughs (Figure 1). One Hobo U12 data logger with 4 temperature probes was set up to record hourly temperatures. The probes were placed under the horse’s neck and rump, on top of the horse’s abdomen, and one was left out to record ambient temperature. The horse was covered with woodchips so that the pile was approximately 1.8 m high. Additional woodchips were added to the pile on August 13 and the pile was covered with a breathable polyester compost cover to collect only what was leaching from the animal. 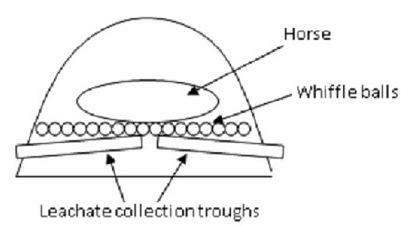 Figure 1 Cross-section of horse compost pile showing placement of leachate collection troughs and woodchip-filled whiffle balls. On 8/10/10 a 0.6 m high base (3.5 x 3.5 m) of coarse carbon material was laid near the horse compost pile. A 455 kg 3 year, 7 month old, 2nd lactation Holstein cow was euthanized, due to a lung abscess, in the same manner as the horse (300 mg xylazine, followed by 120 ml Fatal Plus®). Four tubes of blood were withdrawn from her milk vein as described for the horse. One Hobo U12 data logger with 4 temperature probes was set up to record hourly temperatures. The probes were placed under the cow’s udder and rear leg, on top of the cow’s back, and one was left out to record ambient temperature. The cow was then covered with woodchips so that the pile was approximately 1.8 m high. Additional woodchips were added to the pile the following day before the pile was covered with a compost cover. In year one, phenylbutazone concentrations in the liver of the horse were undetectable (< 10 ppb) by 20 days of composting or burial in loose soil and were undetectable in effluent from the pile at the time of first sampling on day 6. Pentobarbital concentrations were undetectable (< 10 ppb) in liver samples retrieved from both the compost pile and loose soil by day 83. Rate of decay was faster in the soil, exponentially decreasing by 18% per day, with a half-life of 3 days, than in the compost pile where there was a 2% decrease per day and a half-life of 31 days, but occurred at the same rate of 1% and a half-life between 55 and 67 mesophilic degree days when calculated on the number of mesophilic degree days to which it was exposed. This suggests that breakdown of pentobarbital is not initiated by the heat of composting, but by the biological degradation that occurs in both soil and compost at mesophilic temperatures. Pentobarbital in the effluent decreased by 20% per day with a half-life of 3.1 days but was still detectable (0.1 ppm) at 223 days of composting. In year 2, phenylbutazone was not detected in any of the samples analyzed (compost and leachate) other than blood taken from the jugular vein of the horse immediately after euthanasia. Pentobarbital concentrations in the compost were still detectable after 224 days of composting, but had decreased from 79.2 (initial) to 5.8 ppm. Pentobarbital in leachate was 2.2 ppm at day 56 of composting, after which no additional fluids leached into the leachate collection containers. Rate of decay in the leachate was 35.2% per day with a half-life of 1.6 days. When managed properly, composting will deter domestic and wild animals from scavenging on treated carcasses while they contain the highest drug concentrations providing an effective means of disposal of euthanized and/or NSAID treated livestock. The resulting compost contains either no or very low concentrations of both NSAIDs and barbiturates rendering it safe for use in agriculture. Barbiturate poisoning in domestic and wild animals has occurred from ingestion of tissue from animals euthanized with pentobarbital. Many of the reported cases have occurred from direct feeding on improperly disposed livestock in which little or no degradation or biotransformation of pentobarbital has occurred. During the time period in which carcasses would be desirable to domestic and wild animals as a food source, composting creates sufficient heat to deter them from digging in to the pile. In addition, when covered properly, the smell of decomposition is minimized, also reducing attraction. The diverse community of microorganisms in the compost pile aids in the degradation and biotransformation of pentobarbital, especially after the thermophilic phase of composting is over. Properly implemented composting, as a means of disposal of euthanized or NSAID treated livestock, will deter domestic and wild animals from scavenging for carcasses when they contain the highest drug concentrations. The resulting compost contains either no or very low concentrations of either NSAIDs or barbiturates, rendering the compost safe for use in agriculture. Education and implementation work continues in this area nationally and internationally. A 5th International Symposium on Depopulation and Disposal of Livestock is in the planning stages. A study on the Fate of anthelmintics (drugs that expel parasitic worms from the body) in livestock manure has just been completed.